1/3 cup treacle brown sugar. 1 tsp black pepper powder. 1 330ml can of beer. 1 can of pineapple rings. Wash, pat dry the chicken with a hand towel and set aside. In a bowl, mix all the chicken rub spices together. Using half the mixture, rub the entire chicken with the spices. Wrap nice and tight in cling wrap and pop into the fridge to marinade overnight. Empty half of the beer can and stand the beer can up with the remaining beer. Place the chicken on top of the can and gently push the can into the chicken. Pop into a preheated oven at bake at 180C for an hour, standing up. 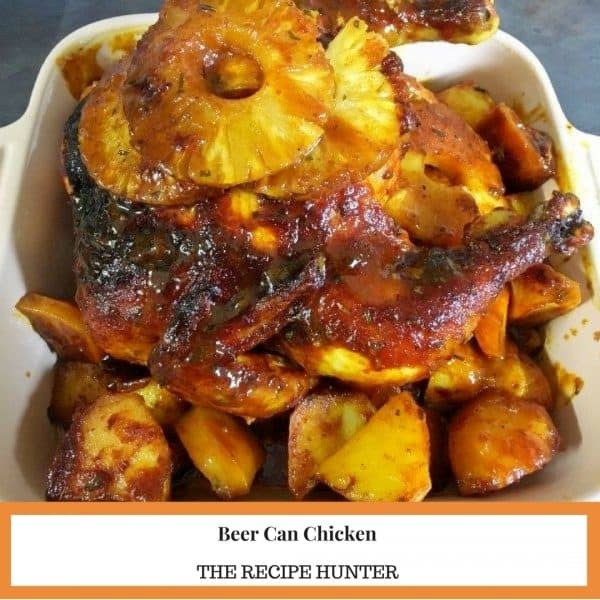 After the hour, remove the can from the bottom of the chicken, stuff with the pineapple rings and set aside. Pour the BBQ sauce into the remaining spice rub and brush the chicken down with the sauce. Pop it back into the oven and bake until deliciously golden brown.